This Travel Lite hard-sided truck camper model 800 series fits most full size 1/2 ton trucks and larger. Step inside the rear entry door and find a storage area with removable porta potty on the right, and wardrobe closet on the left. 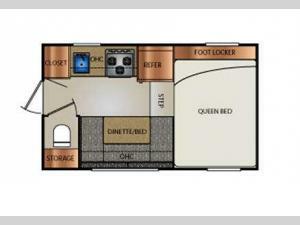 There is a single sink with high rise faucet, a three burner range for cooking, and a refrigerator on the left side. Opposite find a u-dinette bed combo for meal time enjoyment and sleeping space for extra guests. There is also plenty of overhead storage on both sides for your things. 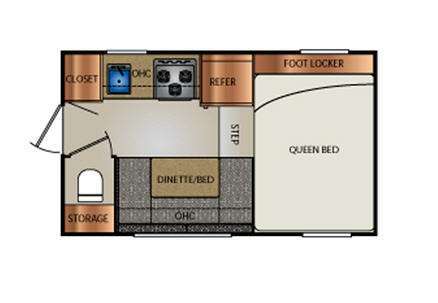 Step up front to a queen bed in the cabover space with a foot locker for storage on the left. You can choose to add a built in microwave oven, a 5 cu. ft. refrigerator upgrade, removable carpet, and so much more!